Robert E. Constant is a creative writer who is at the start of a burgeoning hobby as a children's book author. Robert is a senior level fundraising administrator with over 20 years of experience in higher education and has worked with respected academic institutions like Southern Methodist University, the University of Virginia, Seton Hall University, and Rutgers University. He received his Bachelor's Degree from Tuskegee University in 1998 and his Master's Degree in Sports Administration from St. Thomas University in 2001. Robert has always had a love for education and sports, so he is thrilled to have had the opportunity to write a children's book embracing both. What do George Washington Carver, Rosa Parks, and the Marching Crimson Pipers Band all have in common? They are all affiliated with the history of Tuskegee. George Washington Carver was a botanist, who joined Booker T Washington at Tuskegee University and is known for his innovation with the peanut; Rosa Parks was a seamstress, born in Tuskegee, who refused to give up her seat on the bus to a white man, and the Marching Band is the apple of the Tuskegee University’s eye. In Hey Tuskegee! 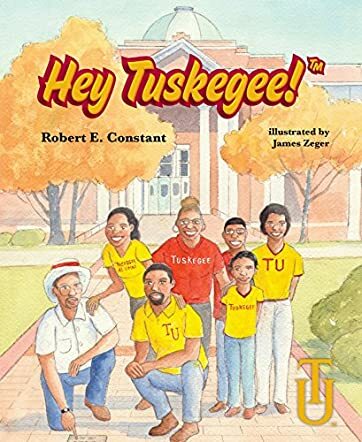 by Robert E. Constant, children will learn about the wonderful and rich history of Tuskegee. As they look at the colorful illustrations by James Zeger, children will also discover and become educated on the historical landmarks, beautiful places, traditions, and educational institutions that are important to Tuskegee. Join siblings Robbie and Saniyah as they take a journey along with their parents back to Tuskegee University. As with Robbie and Saniyah, children will not only learn about Alabama, but will be able to see and understand through their journey why being an alumni, connecting and giving back to Tuskegee University, makes such a crucial statement. These efforts are what will help to maintain the legacy of Booker T Washington, founder of Tuskegee University and its first president. This book was important for me, as a follower of the works of George Washington Carver, because his inventions from the concept of the peanut shows the importance of Science, Technology, Engineering and Math (STEM) and how it can benefit our children. I enjoyed the explosion of energy, unity and spirit continually coming off the pages when reading about the Tuskegee Marching Crimson Pipers Band, traditional songs, stepping competitions, homecoming, and the Fraternities and Sororities, all activities that stimulate the community, sense of belonging and culture that Tuskegee University is known for. Tuskegee, FAMU, and Howard are amongst the southern universities that exude pride because despite the odds these founders faced, they were still able to establish a legacy that will continue for generations to come. If you are seeking out a book for your child that will make a great impact, add this one to your library.